Happy Tuesday and thanks for stopping by to check out the newest SHOPPING OUR STASH challenge! This week we would like you to dig into your stash for hidden gold!! My cousin asked me to make a Harry Potter themed birthday card for her lovely sweetie friend who is celebrating her 30th birthday this month. AH HA!!! Perfect opportunity to use up some of that gold cardstock I have been protecting in my stash like it was real gold. If you are a Harry Potter fan, hopefully you get the references. I did show this card in advance to fellow SOS design team pal CHRIS and she gave me the Harry Potter thumbs up...so that made me feel pretty awesome!! 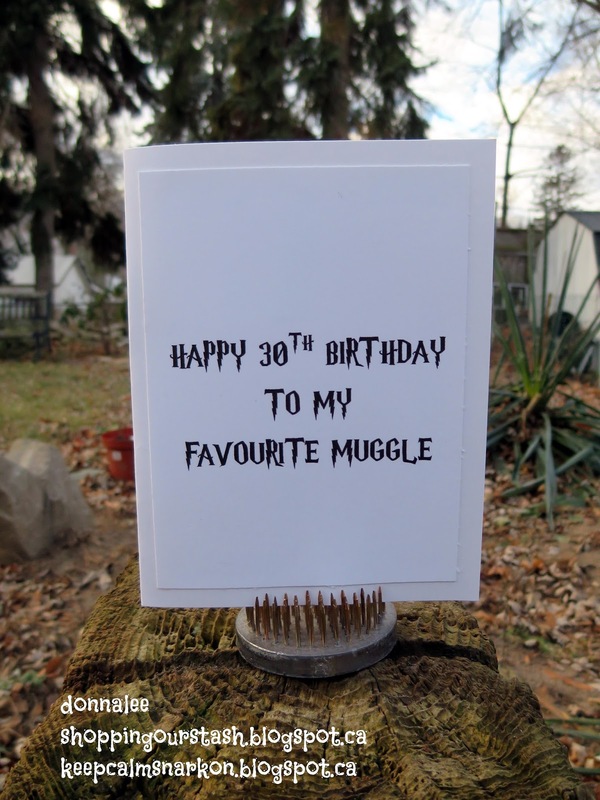 Here's the inside of the card, I even downloaded a Harry Potter font! As always, we would LOVE for you to play along with us. You can find all the details for the challenge at the SHOPPING OUR STASH BLOG. While you are there, please share some crafty love with the other members of the crew. Love Harry Porter, fabulous movies and even more fabulous the books. Awesome card Donna, I love the "scar" and the font on the inside sentiment, that is just perfect for this card, your friend's friend will flip out when she receives it!!! I also hoard gold card stock, Tee Hee!! PS. Would you please add your snail mail address to the list on the Chatter page? I'm getting ready to send my Valentines and I would love to send you one. This is perfection!!! love it and I'm sure your friend will too. it's fun getting odd ball requests for cards and nailing it!!!. Love that inside font awesome. A thumbs up from this Harry Potter fan too!! Awesome card, I love everything about it!!! Ohhh... super cool! Seeing this in the SOS gallery, I was all about it. Now seeing the inside with the font... RADICAL! Next level sh*t right there! I laughed at your comment about guarding your gold paper like it was real gold! Yay, you shopped your stash! You went for the gold and found Harry Potter! WTG! LOL Love the card, and especially love those fonts in the sentiment! A thumbs up from me too! 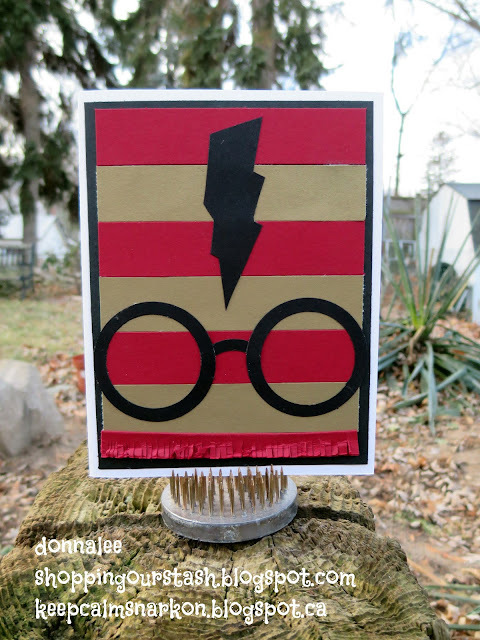 Love this imaginative HP creation! I think you win the Goblet of Fire award for this fantastic HP themed card! I already loved the front, but that font on the inside? BRILLIANT!!! Of course! The scar, the glasses and the scarf! How clever and sure to be loved by a fan. Sorry I am late commenting! I was under the weather and then my computer crashed! :D) I am trying to catch us before this bad boy goes down again! Your project is awesome! Unique and creative!